Lewis Bruce top scored for Peterborough Town at Old Northamptonians. Not often in the past five years or so has it been possible to write that Peterborough Town were outclassed. 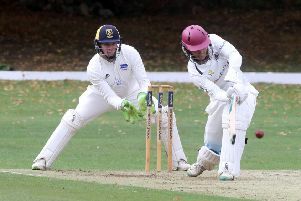 But it happened yesterday (June 18) as Town were thumped by 119 runs by Northants Premier Division leaders Old Northamptonians at Billing Road, in a battle between the top two. Joe Dawborn claimed 4-66 for Peterborough Town at Old Northamptonians. Town won the toss, but nothing else for the next six hours, Even the decision to put the home side into bat backfired thanks to some woefully inaccurate seam bowling and regular fielding lapses. ONs raced to 100 in just 19 overs and, apart from a mini-wobble in the latter overs, they maintained a steady pace to post a 50-over total of 231-7 which was always likely to be far too many on a wearing pitch. And so it proved as Town slumped to 23-4 and 47-5 before Lewis Bruce organised resistance that took the city side to within six overs of saving the day. Unfortunately Bruce was bowled by a ball that appeared to travel underground for 34 and it was then just a case of the home side staying patient to break a lengthy partnership between Chris Milner (7 from 45 balls) and Joe Dawborn (13 from 31 balls). Town’s total of 111 wasn’t even enough for a consolation bonus point. Dawborn (4-66) returned the best figures for Town, although Bruce (2-54, 15 overs) bowled with more accuracy. It was a great day for ONs as Finedon, who started the day in third place, were surprisingly beaten by Finedon. ONs are now 26 points clear at the top with Finedon and Town, who meet at Bretton Gate next Saturday (June 25), sharing second place. Bowling: J. Dawborn 13-0-66-4; J. Smith 10-0-46-0; M. Danyaal 4-0-18-0; L. Bruce 15-3-54-2; D. Sayer 8-0-36-1. Bowling: T. Webb 9-1-37-3; T. Heathfield 11-2-27-; W. Heathefield 8-1-14-0; R. White 10.3-1-15-1; D. Bell 3-1-8-0; D. Waite 2.4-0-8-2. Oundle are now next-to-bottom of the Premier Division after they were crushed by 117 runs by Rushton at Milton Road. Oundle also fell into the trap of inserting the opposition on a cloudy day and following overnight rain. Just like five other top-flight teams who followed this policy, they were beaten comfortably. Rushton’s 226-8 was always likely to be out of reach for a team who lack quality batsmen, but Oundle never even came close to securing a draw as they were dismissed for 111 in just 36 overs and five balls. Skipper Bashrat Hussain (2-13 from 19 overs) bowled with skill and accuracy, but only Tshepo Moreki (32) and Pete Foster (21) made any impact with the bat. Captain Andy Reynoldson (4-21), an occasional Oundle player, bowled well for Rushton. Rushton 228-6 (R. Henry 58, J. Bindley 49, M. Steed 27, B. Hussain 2-13, T. Mofreki 2-70). Oundle 111 (T. Moreki 32, P. Foster 21, M. Steed 4-20, A. Reynoldson 4-21).